As a fun weekend activity I decided to dust off some of my various experimental Bitcoin market indicator charts to see if they can help shed any light on the outlook for Bitcoin prices. Adding to the mix this time is a look at 2018 trading YTD in the context of the average seasonal trading pattern, and a survey on investor allocations to Bitcoin and cryptocurrencies. We also review some of the charts I previously introduced (short interest, search sentiment, and speculative futures positioning). All up the charts appear to be consistent with at least a short-term bottom – and without knowing anything else a slight bullish medium term bias. (albeit please read the disclaimer at the end!). -Investor uptake of (i.e. allocations to) Bitcoin/Crypto-currencies is still substantially lower than that for gold. 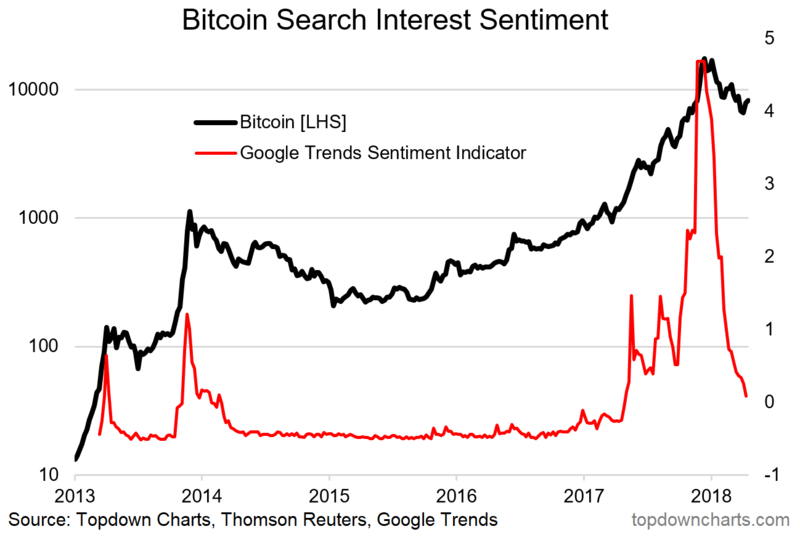 -Sentiment, futures positioning, and short interest seem consistent with at least a short-term bottom in the Bitcoin price. -Seasonality analysis seems to indicator a seasonal surge occurs around June, which is an interesting piece of information given what the other indicators are saying. 1. Asset Allocation - Where Does Bitcoin Fit? Here's some interesting perspective on the uptake of cryptocurrencies as an asset class by investors. 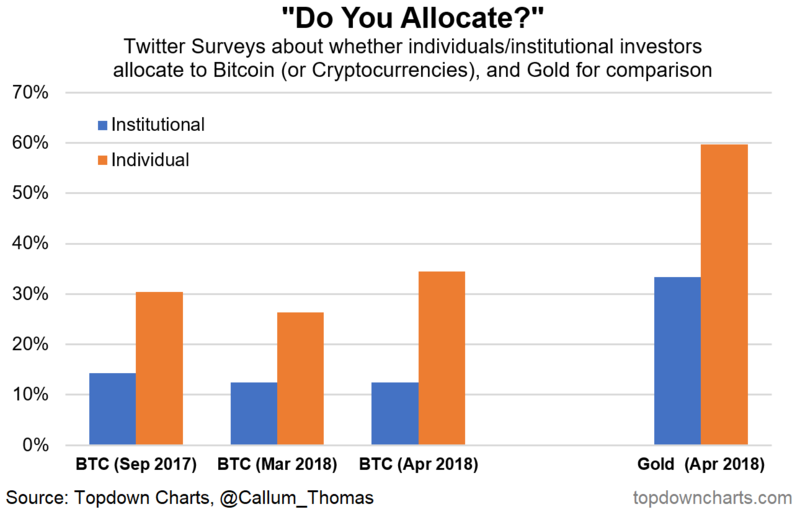 It's a not entirely scientific approach, like my weekly sentiment survey it simply asks my followers on Twitter (most are investors or market watchers in some capacity) whether they allocate to cryptocurrency in their portfolio - and whether they are individual or institutional investors. The results show apparently just over 10% of institutional investors are allocating to crypto, whereas in the latest survey just over 30% of individuals are. I asked the same question for gold - to provide a comparison, and it seems 3 times as many institutional investors allocate to gold, and about twice as many individuals do. So it gives you some idea of where investors' thinking is around the role of cryptocurrencies in a portfolio. 3. 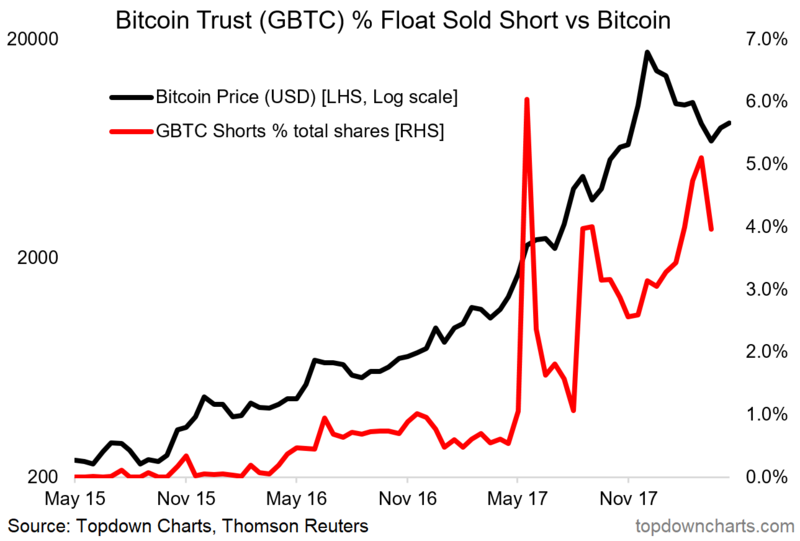 Bitcoin Trust - Stock Sold Short: Another sentiment-type indicator is the percentage of stock in the Bitcoin investment trust (GBTC) which has been sold short. When this indicator spikes it represents substantial bearishness on Bitcoin (as traders attempt to profit from falling prices by selling short), it also represents potential future buying power as those who have sold stock short eventually need to cover their positions by buying the stock back. I think the fact that this indicator spiked and then rolled over is a powerful signal - in hindsight it called the short-term bottom in price. 4. 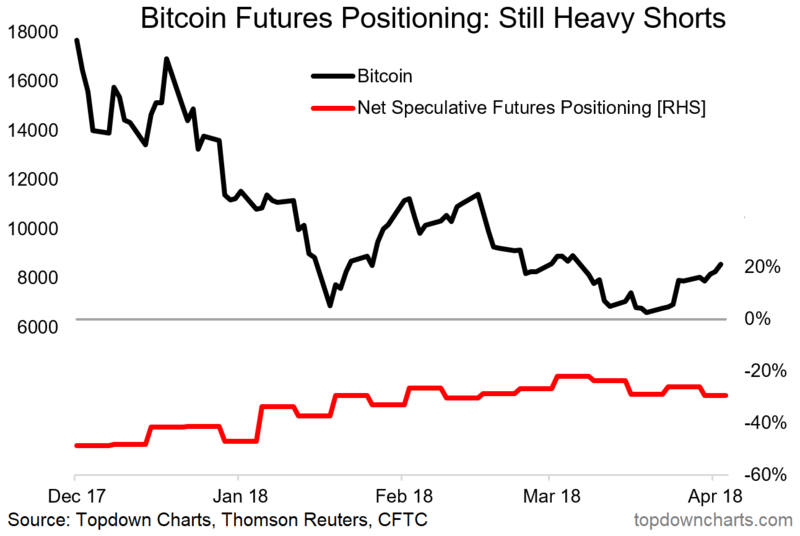 Bitcoin Futures Positioning: The speculative futures positioning indicator for Bitcoin, still very much nascent (only just over 4 months of data) seems to show what technical analysts call "bullish divergence" - price makes lower lows as net speculative shorts trended upwards (i.e. got less short). Bullish divergence can be a great way to pick turning points, and at least short-term a potential turning point has been established. 5. 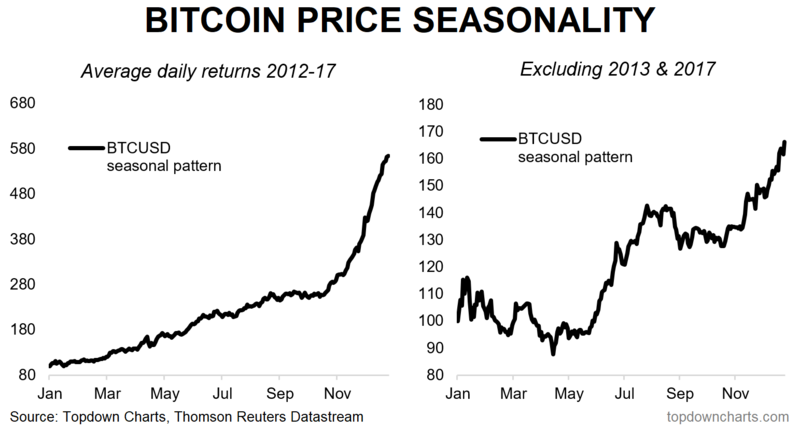 Bitcoin Price Seasonality: I talked briefly about seasonality in the article "5 More Charts on the Outlook for Bitcoin prices", so I wont labor on it again, but for reference, the charts below show the overall seasonal pattern across the 2012-17 daily trading history, and also excluding the particularly exceptional years 2013 and 2017. The methodology is simply to calculate the average daily percent change in price by business day and then this is applied to a base of 100 = 1 Jan. There seems to be a seasonal pickup in June/July. I'm not sure why. 6. Seasonality in 2018: Looking again at seasonality, using the ex 13/17 series, the 2018 experience seems to be somewhat in line with the overall pattern (not looking to match up the magnitude because I am more interested in the pattern of movement - so no I am not predicting it goes to 20k, I don't know where it will end up!). 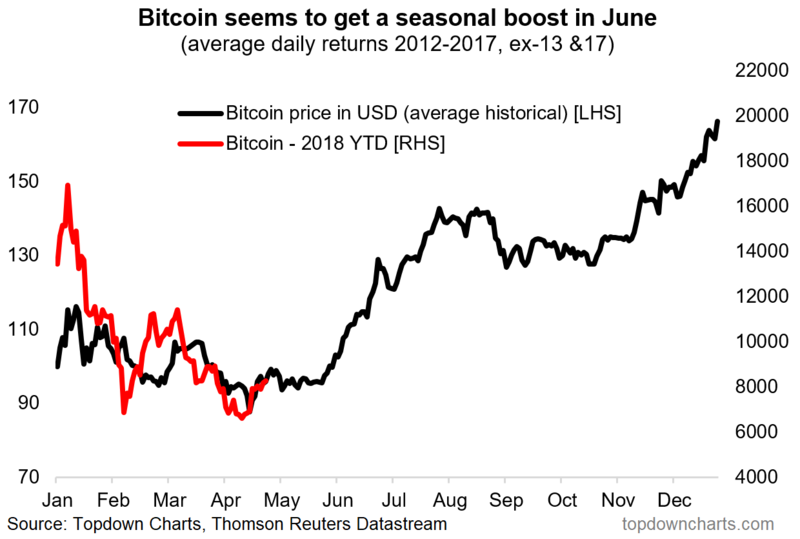 So the question that should be on any crypto-investors mind is will June see the same seasonal surge? Time will tell, but a lesson from the stockmarket where seasonality is a well-established and widely researched phenomenon: seasonality doesn't always work, and has a habit of breaking down when you need it the most! So use it as another piece in the overall puzzle, but be wary of relying on it. Disclaimer: I do not own Bitcoin or any other Crypto-currency, and have not ever, and do not have any intention to purchase in the immediate term. This analysis is provided as-is, and attempts to apply some of the traditional financial market analysis techniques and extend some of my market models from currency/stock markets to this emerging asset class, basically as a public service. It is not advice, an offer, or a recommendation. So take this analysis with a grain of salt. Feedback is welcome.